Browns quarterback Jason Campbell said the team has more to play for than just "playing spoiler" to Pittsburgh's playoff hopes. 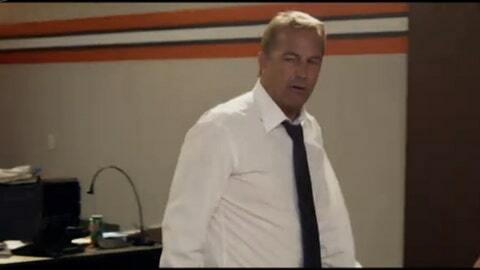 BEREA, Ohio — The Browns have used the word ‘finish’ a lot this season. Most of the time, it’s been a negative as the Browns have not been able to finish. They have not been able to finish the first half. They have not been able to close out games. The Steelers have a mathematical chance to still make the playoffs and the Browns could end that possibility for their rival. "Our guys are aware of that," Rob Chudzinski said. "There are a lot of things we’re playing for." However, Chudzinski said this week is all about ending the season on a positive note. "Our focus is on the Steelers and finishing the season the right way." John Greco, who grew up between Cleveland and Pittsburgh in Youngstown agreed. "We’re not going to the playoffs, but we’re going to be playing hard," Greco said. Jason Campbell said the Browns have a lot to play for as a team. "Going into the last game of the season, we have a lot to play for," he said. "It’s not about being a spoiler, we want to go out on a good note. "We’ve been so close in so many games," Campbell said. "The guys want to go out and get a win." Just going back four games, the Browns gave up 10 points in the final 1:18 of the first half against the Jets to erase the lead they had. They gave up an 80-yard touchdown drive with 3:19 to play that sealed the victory in the fourth quarter. 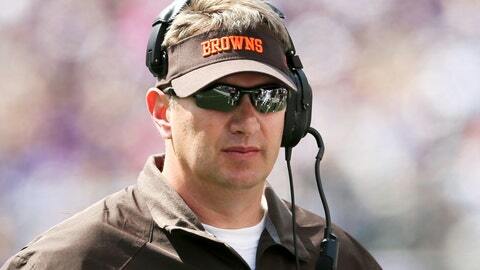 The previous week the Browns gave up three fourth quarter touchdowns in a loss to the Bears. Earlier, Brandon Marshall scored a touchdown with 24 seconds to play in the first half. The Patriots game was an epic collapse as they scored two touchdowns in the final 1:01 to overcome a 26-14 deficit to defeat the Browns 27-26. Only a week before the Patriots loss, Cecil Shorts scored a touchdown with 40 seconds to play to defeat the Browns 32-28. In the final 1:19 to play of the first half, the Browns allowed the Jaguars to score three times and score 13 points. Chudzinski is still looking for answers. "I think that looking at the last few weeks, the fact that we’ve had leads, we’ve played well coming into games and starting games and have had good starts and started fast, and we haven’t been able to maintain those leads," he said. "Each week it’s for different reasons. That’s the difficult thing, is to pin one thing down. When you can pin it down to one thing, you can fix it. Sometimes you fix one thing and something else pops up. "As I mentioned, you look at tape and there’s some good things," he said. "Whenever you play there are some good things and there’s some things that aren’t good. Special teams played great yesterday, made three big plays for us. At times there’s been issues with that and some of the games that we’ve played. Offense has had their issues at times; defense has had its issues at times as well. But overall, that’s the thing we need to get better at to grow as a team, because if we do and are able to protect those leads, or score and continue to build on those leads and win those games, that’s the difference." Chudzinski thinks some of it is in the player’s minds. "I think it’s a combination of things as you look at it," he said. "It’s about a mindset to begin with. We’ve talked a lot using the term, ‘the last five.’ The last five minutes of each half, of wanting to win the last five. That’s been a huge point of emphasis. The guys are aware of it, they know it, they want to do well, but you have to execute as well, and you have to make plays when you have the opportunity. From a coaching standpoint we have to do everything we can to put them in the very best position for that. We need improvement in all of those things." Greco Back: In some good news, OL John Greco is practicing and could play left guard against the Steelers. Chudzinski said Greco is practicing, but is still listed as limited with the knee sprain. "We’ll see how he does." Greco thinks it’s important to play, if he can. "If I was hurt, I wouldn’t be playing," he said. "There’s no reason to sit out if I’m healthy." 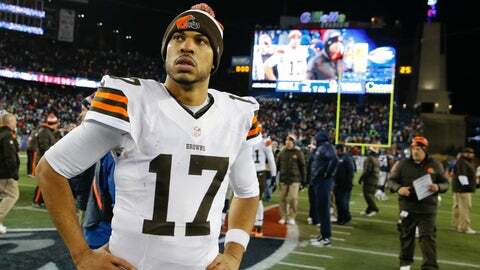 Campbell’s Chance: QB Jason Campbell said he wants to finish strong and show that he still has a future with the Browns. "(Opportunities as quarterbacks in the NFL) are hard to come by," Campbell said. "I want to take full advantage of my opportunity." Campbell has had some good games and some not so good and he doesn’t know if the Browns want to bring him back. On the season, Campbell is 157-of-276 for 1,775 yards with 10 touchdowns and seven interceptions. His rating is 77.8. However, he’s coming off his worst performance of the season with a 37.8 rating with no touchdowns and two interceptions. "What’s going to happen is going to happen," he said. "Myself, I just want to finish the season going out on a win." Campbell said he talked to his father, Larry, and he told him to relax and be enthused about playing. Campbell was asked what he wanted for Christmas. "Christmas is a time to be jolly, not sullen," he said. "I want to go out and cut it loose. "I don’t need a Christmas gift, just a win." Mash Unit Grows: The Browns were missing several players for Wednesday’s practice. TE Jordan Cameron (concussion), DL Phil Taylor (concussion), OL Jason Pinkston (concussion), DB Joe Haden (hip), OL John Hughes (sprained knee) and TE Andre Smith (calf) didn’t practice. OL John Greco (knee) was limited. Baker’s Dozen: RB Edwin Baker has been a bright spot for the running game after being picked up from the Texans’ practice squad. "He’s been productive," Chudzinski said. "Sometimes, it’s about opportunity and the fact he was able to play right away with his familiarity with Norv’s system gave him the opportunity and he’s shown well." In two games, Baker has carried the ball 25 times for 102 yards with two touchdowns. He has averaged 4.1 yards per carry. In comparison, former Browns RB Trent Richardson had 31 carries for 105 yards (3.4 avg.) before he was traded with no touchdowns.